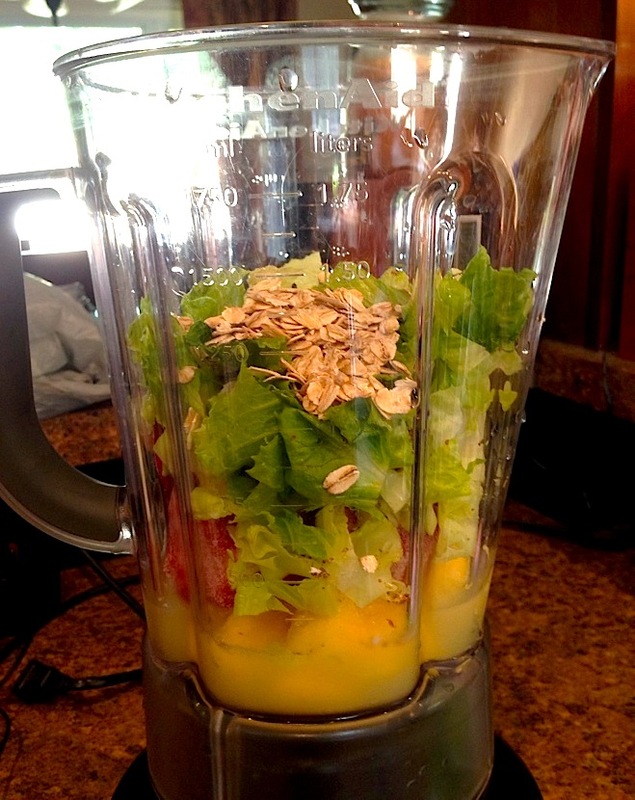 August 29, 2013 by sammysamgurlLeave a Comment on Strawberry Mango LEO Smoothie! Goodmorning! 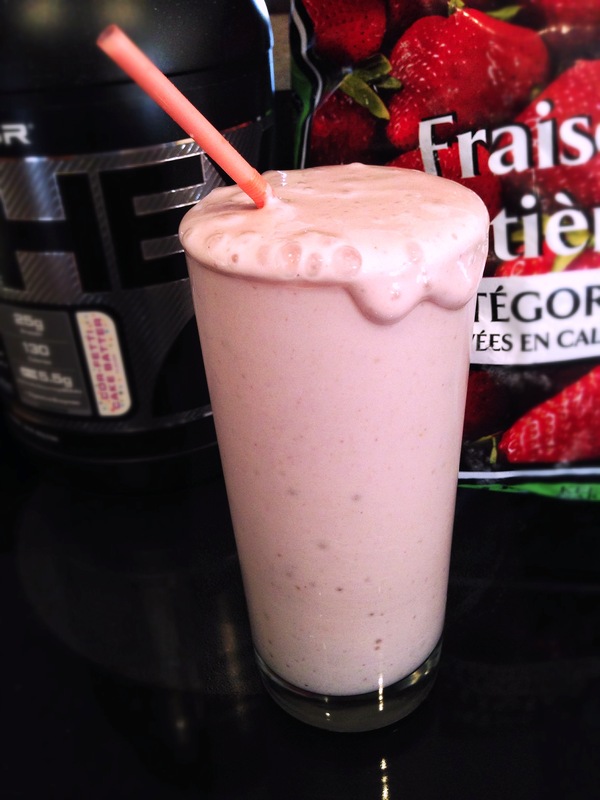 Ready for a delish natural vitamin/fibre/protein packed smoothie to start your day?? I totally made up the name for this by using LEO as a cute short form. The actual full name would have been Stawberry Mango Lettuce, Egg white & Oatmeal smoothie so I thought I’d make it easier on you all and shorten it like we do with BLT. haha. 🙂 So I know to some this combination of flavours sounds weird and not to appealing but if you’ve never tried a smoothie with these ingredients before, then your in for a surprise! The oat flavour pairs really well with the fruit and the romaine blends so you hardly know it’s there, covered by the sweet taste of strawberry and mango. Plus egg whites are a great source of protein without adding any flavour. Overall I loved the tangy/sweet taste of this shake! I will be making it again! Let me know if you try it :). Directions: Combine all ingredients in a blender until very smooth! Serve in a bowl and eat with a spoon or a cup with a straw, whichever way it will be delicious! Enjoy! Okay so the first time I tried crepes, I didn’t like them. Why? They served them plain with no sauce or fruit! That’s like serving PB & J without the PB & J!! So when I went to Mexico and saw the had a crepe booth, I was a bit skeptical of how they would taste. But oh my lord, these were amazing! They had a warm chocolatey filling served atop a sweet strawberry sauce with chopped bananas, strawberries & powdered sugar on top of the crepe itself. Word’s cannot describe how amazing these were. When I got back I forgot about my amazing crepes for awhile..that is until this morning when I had this crazy craving for crepes! 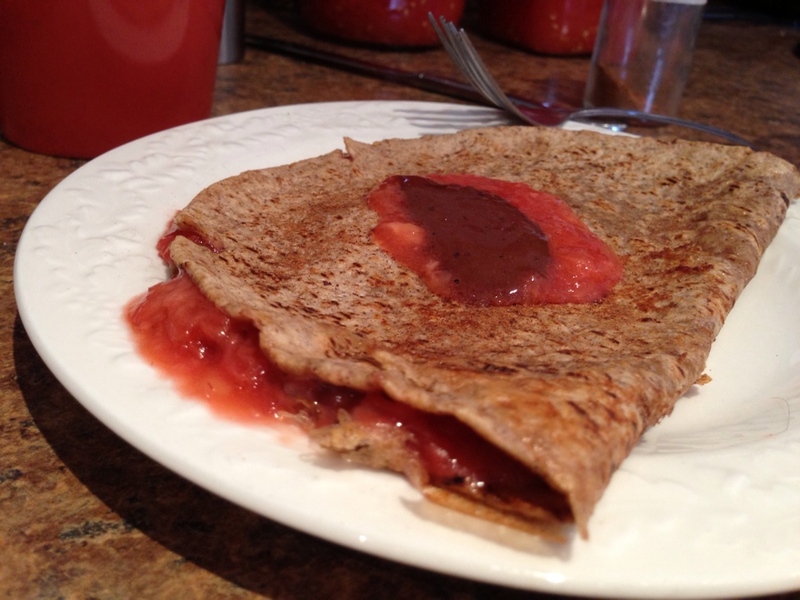 Knowing I could not deny this craving, I created my own version of those memorable crepes. The result?? They are awesome! The filling is sweet and delicious, I could just eat it off a spoon! & The chocolate Sauce? OMG heaven. The crepe was done french toast style so it’s light cinnamon sugar flavour just adds to the awesomeness of this dish. -1 tbsp homemade SF Chocolate Syrup. Directions: Heat a large pan over medium-low heat. Spray generously with cooking oil(up the sides as well). In a large flat bowl, combine egg whites, almond milk, vanilla, salt, truvia and cinnamon with a fork. Meanwhile place the frozen strawberries in a small microwavable bowl and microwave on high for 2 minutes or until they are easy to mash. Stir in your banana and sweetener and sweeten to your liking. Microwave for another 20 seconds until hot. Now dredge your flatout wrap in the egg white mixture on both sides until well coated. You may have some extra batter that you can use up in my French Toast egg whites recipe! Now place the wrap in the hot pan and cook until browned on one side. Flip and cook for a bit on the other side. Now place half of your filling over one side of the wrap and fold. Cook for a few more minutes then take off the heat, top with extra strawberry-banana sauce and a dollop of chocolate sauce. Sprinkle some extra cinnamon and eat up! :). Enjoy! So here is another recipe to cool you down on those warm spring days we are having this year! It’s beautiful to look at and tastes great too! Best part is..you can eat the whole bowl without an ounce of guilt. Why? Well..because it contains: 255 calories, 3g fat(0g without topping), 21g protein & 5g fibre. This creamy delicious strawberry-banana ice cream is a play off of my original Coconut-Banana-Mango Ice Cream recipe. I decided to substitute strawberry for mango after my mom came home with probably the largest bag of frozen strawberries I have seen in my life(from costco of course). & I have to say, I can’t decide which kind I prefer! They are both completely delicious! Also if you didn’t hear..each bowl of ice cream contains a secret ingredient to increase the protein without changing the taste or texture(no protein powder!) read on to find out more… Take me to the recipe! 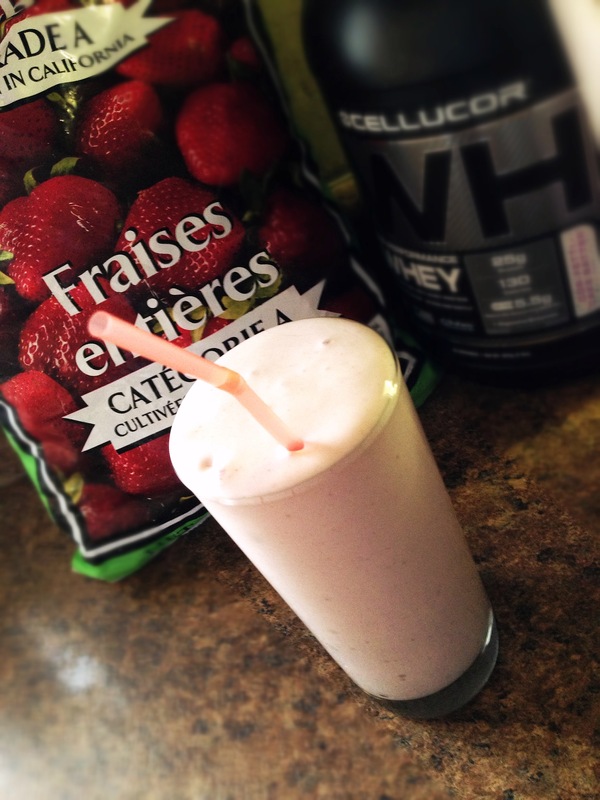 April 14, 2013 by sammysamgurlLeave a Comment on Strawberry-Banana Protein Ice cream! I scream, you scream, we all scream for ice cream! Okay soo, today I felt like a nice thick shake that I could eat with my new adorable spoon! It turned out more like ice cream then a shake and it was very filling and delicious! The recipe makes 2 servings or one HUGE glass! It’s super high protein and not just because of protein powder…keep reading if you want the recipe! Take me to the recipe! Good Morning! Happy Saturday everyone 🙂 I hope you are all still eating clean as always. I have a new recipe for you guys if you are in that awful breakfast rut I know we all get in. I’ve been there. Breakfast has got to be the hardest meal to figure out what to eat. For me, I just have to have something sweet or carby for breakfast, I like eggs but personally I am not the biggest fan of them. That’s why smoothies are my go to breakfast! There are so many new and delicious combinations of fruit, it’s hard to get tired of them. Only problem is..it’s cold outside and I am drinking an ice cold smoothie…not the best combo. But to me it’s worth it. I will just huddle up near my fire place with a ton of blankets covering me. That’s how I spend my every morning haha. Back to the smoothie, the mango and strawberries together make this so sweet tangy and delicious. It almost reminds be of a creamy fruit dessert. Try it out and let me know what you think! -Optional: Honey for added sweetness(I didn’t add any since I found it to be already sweet enough with the fruit and protein powder). Directions: Place ingredients in the blender in the order listed to avoid protein powder sticking to the bottom of the blender. 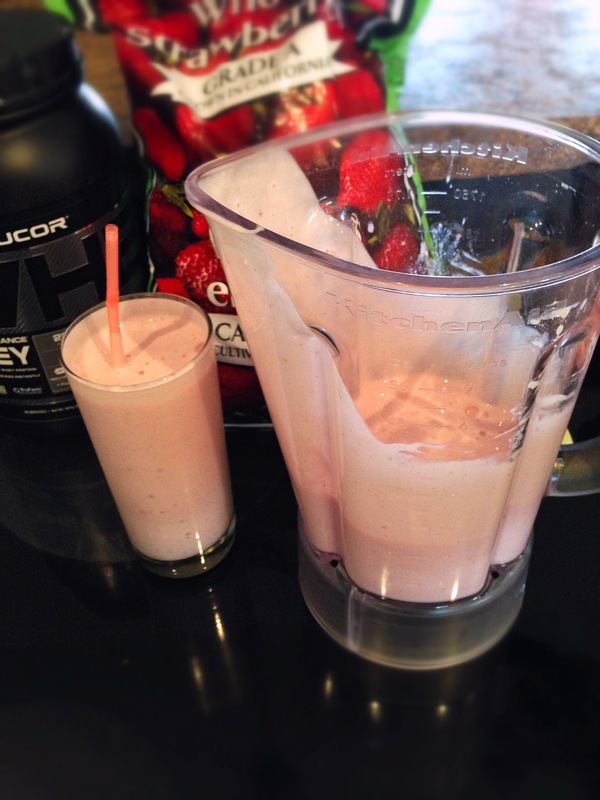 Blend on high until smooth, pour in a large cup and garnish with a fresh strawberry..enjoy! Hey everyone! I haven’t been able to post in a while but finally it’s the long weekend so I have sometime to post my latest recipes! 🙂 To start my posts off I have an awesome new way for you to eat oatmeal that will have you enjoying every last bite! Take me to the recipe! Well here is a couple of my snacks i’ve been eating for the past few days. They are.. Read More!